Raw neural data, recorded from an EEG or other BCI device, includes a broad set of information about brain activity and some noise from external interference. Even with minimal noise, the complexity of the data in its raw form can be difficult to interpret. Feature extraction is the process of identifying and extracting meaningful information from raw neural data. This reduces the noise as well as the volume of data, making it easier to identify patterns and improves the accuracy of the BCI. Some feature extraction methods are unsupervised. They do not use example data labelled with features to learn from. They simply extract the most significant information on their own by discarding similarities and focusing on the differences in the data. These methods include Principal Component Analysis (PCA), Wavelet transform, and more. Other methods like Common Spatial Patterns (CSP) are supervised. They require a set of labelled data to determine the specific patterns you would like to extract. The choice of feature extraction methods will depend on several design choices including the type of brain processes being captured. In this document, we will focus on BCIs based on event-related potentials (ERPs). The feature extraction step for ERP-based BCIs is fairly simple. The first step is to extract epochs. An epoch is a chunk of an EEG signal with a specified length and synchronised with an event (i.e. the presentation of a stimulus). Statistics of these epochs are then computed to extract features. For example, one may simply compute the mean voltage recorded at each electrode site during the epoch. This feature is usually sufficient for identifying ERPs. An event-related potential, or ERP, is the electrophysiological response in the brain to a specific motor or cognitive event (e.g. a stimulus). This stimulus can be almost anything: a flashing light, a surprising sound, a blinking eyeld etc. In all cases, a bci using ERP’s will try to isolate and identify these small, event-related responses. A scalp-recorded EEG records the joint activity of millions of neurons making it almost impossible to isolate each and every signal that relates to an ERP. The best we can do is look at the overall voltage changes. We call a change that appears to reflect a specific psychological process an ERP component. An ERP waveform (Figure 1) contains the overall voltage changes over time starting at the onset of the stimulus. It contains several wave peaks, which could be relevant ERP components. Each positive (P) and negative (N) peak is followed by a number (i.e. N1, P2, N2, P3, etc.) representing the distance from the stimulus onset (0 ms). This is the most common naming convention. Any sensory, motor or cognitive event can trigger an ERP, but most BCI’s using ERPs are sensory-based and use either visual or auditory stimuli. Both stimuli are more easily generated by a computer than other sensory input. Also, the visual cortex has been studied for decades, allowing us to better interpret visual stimuli on the brain. Sensorimotor stimuli are also used in some BCIs while olfactory and gustatory stimuli are rarely used. One of the easiest approaches to make the brain generate an ERP is by developing experiments following the oddball paradigm. In these experiments, participants are shown a repetitive sequence of standard stimuli (e.g. pictures of cars) interleaved, rarely by a deviant stimulus (e.g. a picture of a face). Our brain reacts to these “odd” stimuli by generating a large P3 or (P300) ERP component. The P3 wave peak occurs around 300-600 ms after the odd stimuli is presented. It is also called the P300 as when it was discovered it was believed the peak alsways occurred as 300 ms. The characteristics or the P3 make it very suitable for devloping BCIs. First of all, the P3 response is easy to measure with EEG, hence being suitable for non-invasive BCIs. Moreover, a P3-based BCI requires less than 10 minutes of training and it works with the majority of subjects, including those with severe neurological diseases. The P3 is a ERP component reported by Sutton in 1967 but the first P3-based BCI was developed by Farwell and Donchin in 1988 to provide a speller (virtual keyboard) for paralysed people. Users would look at a matrix of letters on a screen and were asked to focuson the letter they wanted to input. The rows and columns of letters would flash randomly and whenever the letter of interest was highlighted it would appear to the brain as an “oddball” stimulus. the stimulus would be detected as a P3 ERP component and the BCI would output the corresponding letter. After this first P3-based BCI was introduced, not much attention was given to this technology. According to Donchin et al. (2000) there were no P3-based BCI peer-reviewed papers from 1988 to 2000. The next five years saw only a modest increase in P3-based BCI articles, which often relies on offline analyses, such as analyzing other groups’ data from the 2003 BCI Data Analysis Competition. In the last decade, P3-based BCIs have emerged as one of the main BCI categories due to several appealing features. It’s straightforward to use, relatively fast, effective for most sers, and requires almost no training. P3-based BCIs can be used for a wide range of applications including controlling virtual keyboards, controlling a mouse, supporting decision-making, and so on. This section presents a hands-on tutorial on how to extract ERPs from EEG data. We use the Python MNE Library, which has good tools for eeg and MEG data analysis. In addition, this library includes EEG datasets which can be downloaded for free. We use the sample dataset provided by MNE and recorded in an experiment where checkerboard patterns were presented to the subject into the left and right visual field, interspersed by tones to the left or right ear according to the following settings: —The interval between the stimuli was 750 ms. —Occasionally, a smiley face was presented at the center of the visual field. —Subject was asked to press a key with the right index finder as soon as possible after the appearance of the face. —EEG data from a 60-channel electrode cap was acquired simultaneously with MEG data. Before starting to extract features from a signal, it’s important to remove the artifacts in order to clean the signals to enhance relevant information embedded in these signals. EEG signals are known to be very noisy, as they can be easilyh affected by the electrical activity of the body (EOG and EMG) and environmental artifacts (e.g. 50 or 60 Hz power line). The preprocessing step aims at increasing the SNR (Signal-to-Noise Ratio) of the signals. ERP components are characterized by specific temporal variations according to the stimulus onset, therefore ERP-based BCIs exploit mostly the temporal information of a signal. The ERP components can be quantified by averaging activity in the EEG time-locked to a specific event. The results in a waveform associated with the processing of that specific event. The ERPs found in such tasks have a characterisitic waveform with clearly identifiable components. 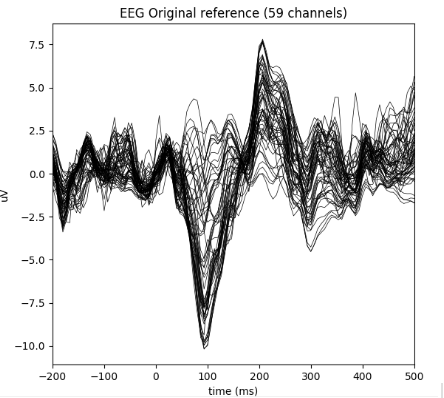 An epoech is a chunk of EEG recording in the time domain. Here we are using the stimulus-locked epoch, which means that we consider 0 as the onset of the stimulus and then we extract the first N milliseconds after that (e.g. if Nis 1500, we are sampling at 32 Hz and we have 100 stimuli, we have 100 epochs of 48 samples (1.5s * 32) for each electrode). Once we have a feature vector, this could be used to in the classification step of the BCI to produce meaningful outputs using machine learning (e.g. Simple Linear Regression, Linear Discriminant Analysis, Support Vector Regression). Brain signals can be measured through multiple channels. Not all information provided by these channels is generally relevant for understanding the underlying phenomena of interest. Dimension reduction technicques can be applied to reduce the dimension of the original data, removing the irrelevant and redundant information. So the computational costs are reduced. PCA is a statistical features extraction method that uses a linear transformation to convert a set of observations possible correlated into a set of uncorrelated variables called principal components. Linear transformations generates a set of components from the input data, sorted according to their variance in such a way that the first principal component has the highest possible variance. This variance allows PCA to separate the brain signal into different components. PCA is also a procedure to reduce the dimension of the features. Since the number of columns is less than the dimension of the input data. This decrease in dimensionality can reduce the complexity of the subsequent classifying step in a BCI system. ICA is a statistical procedure that splits a set of mixed signals to its sources with no previous information on the nature of the signal. The only assumption involved in the ICA is that the unknown underlying sources are mutually independent in statistical terms. ICA assumes that the observed EEG signal is a mixture of several independent source signals coming from multiple cognitive activities or artifacts. 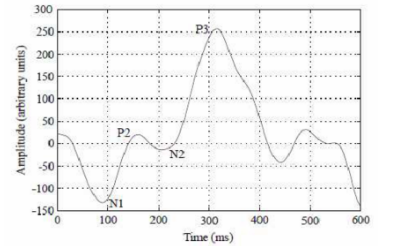 Wavelets are functions of varying frequency and limited duration that allow simultaneous analysis of the signal in both the time and frequency domain, in contrast to other modalities of the signal analysis such as Fourier Transform (FT) that provides only an analysis of the signal activity in the frequency domain. FT gives information about the frequency content, but it is not accompanied by information on when those frequencies occur. If you are interested in broadening your knowledge on ERPs and BCIs, we recommend the following papers/books to read. Most of them are freely available. We also indicated in bold face the main topic covered by the resource. Rohrbaugh, John W., Emanuel Donchin, and Charles W. Eriksen. 1974. “Decision Making and the P300 Component of the Cortical Evoked Response.” Perception & Psychophysics 15 (2): 368–74. http://link.springer.com/article/10.3758/BF03213960. P300 and decision making. Poli, Riccardo, Luca Citi, Mathew Salvaris, Caterina Cinel, and Francisco Sepulveda. 2010. “Eigenbrains: The Free Vibrational Modes of the Brain as a New Representation for EEG.” In 32nd Annual International Conference of the IEEE EMBS, 6011–14. doi:10.1109/IEMBS.2010.5627593. A novel feature extraction method for ERPs. Furdea, Adrian, Sebastian Halder, D. J. Krusienski, Donald Bross, Femke Nijboer, Niels Birbaumer, and Andrea Kübler. 2009. “An Auditory Oddball (P300) Spelling System for Brain-Computer Interfaces.” Psychophysiology 46 (3): 617–25. doi:10.1111/j.1469-8986.2008.00783.x. Auditory P300 BCI speller.